For lunch today I made/invented a new awesome sandwich. We had some leftover Baguette from the BanhMi sandwiches I made for lunch yesterday. The green stuff was Veggie Pate**. The white things are Daikon Radish that I pickled. **C picked his pate off his sandwich, piling it on my plate with a yucky look on his face. I ate it with much abandon. I sliced open the baguette, slathered one side with cream cheese and the other with some Sweet Chili Sauce (*joy*). I layered in Peppadew Peppers, sliced cucumbers and a hard boiled egg. I am trying not to jump up and down with joy as I eat this crunchy, slightly sweet-slightly spicy, bread-y goodness for lunch. LAAAAAAAAAAAA! Veg + Good Bread + Cream Cheese + Sauce = HAPPY ME! 2 (8-inch) baguettes **I used one long one. 2 bulbs Lemongrass, minced **Use a very sharp knife. This stuff is tough. 1 Tablespoon finely chopped cilantro **BLECH. I think this is an optional ingredient! 1- In a large bowl, combine sugar, salt, vinegar, and water. 2- Add daikon and carrots and toss. 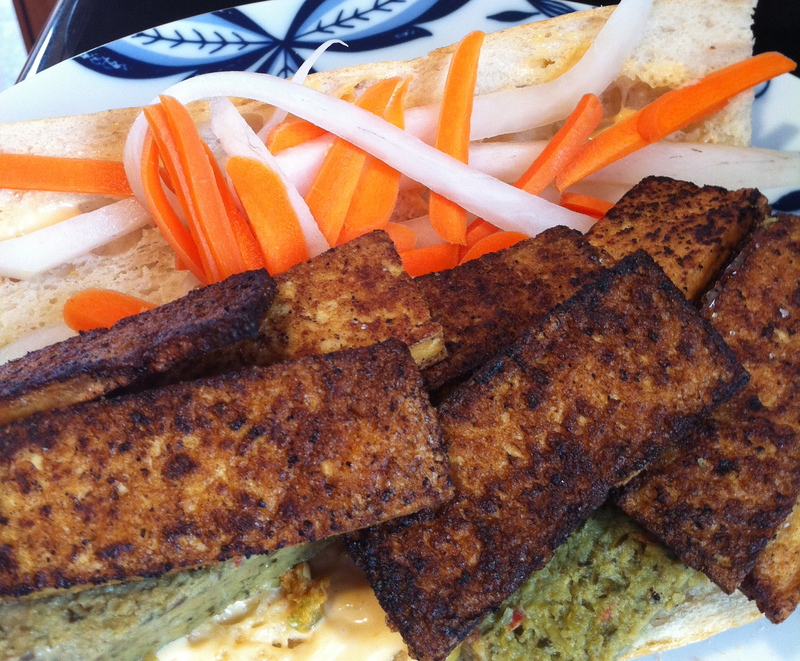 1- Cut tofu into 1/4-inch thick slices and press between clean kitchen towels or paper towels to rid of excess water. **I left it for at least 30-45 minutes to help get the water out. 2- In a shallow dish, combine soy sauce, vegetable oil, sesame oil, lemongrass, and garlic. 3- Place tofu in dish, gently coat slices with marinade, and arrange so they overlap as little as possible. Cover and refrigerate for at least one hour. 4- Cook in a skillet over medium heat until brown and crisp on each side. 5- In a small bowl, combine mayonnaise and cilantro. Add soy sauce to taste, if desired. 6- Slice baguettes lengthwise, leaving one side as a hinge. 7- Spread mayonnaise on top and bottom halves. Arrange fillings and garnishes: cucumber, do chua, tofu, jalapeño. 1- Slice open the baguette. 2- Slathered one side with cream cheese and the other with some Sweet Chili Sauce (*joy*). 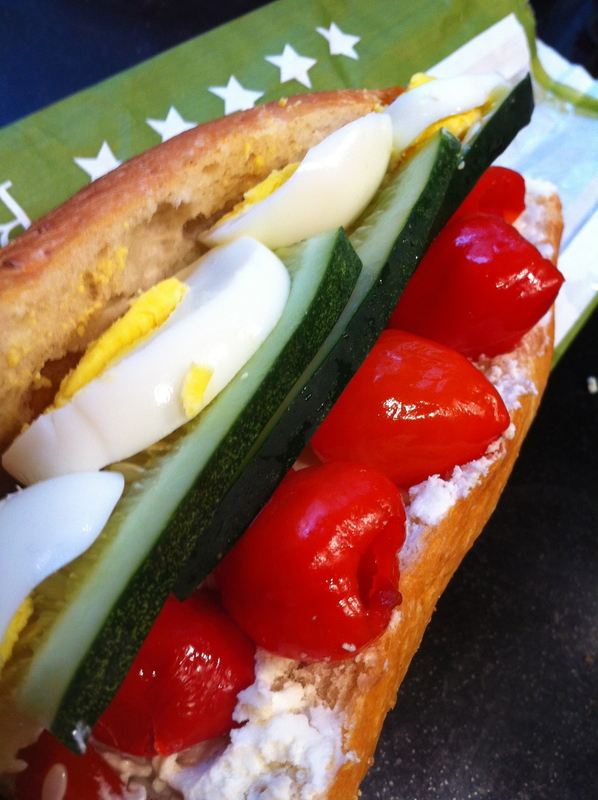 3- Layer in Peppadew Peppers, sliced cucumbers and a hard boiled egg. 4- Try – just try – not to do a little happy happy dance in your seat. Guess we were out of roasted green beans? Don’t eat all of my peppers.